Making a New Year's resolution can be easy, especially when it's still December and you haven't had to start working on your goals just yet. Nobody minds saying they'll work hard and save money in the new year because that's next year, and who cares? Well, next year is coming sooner than we'd like to believe, so you better start deciding on what your resolutions will be, and commit to them. 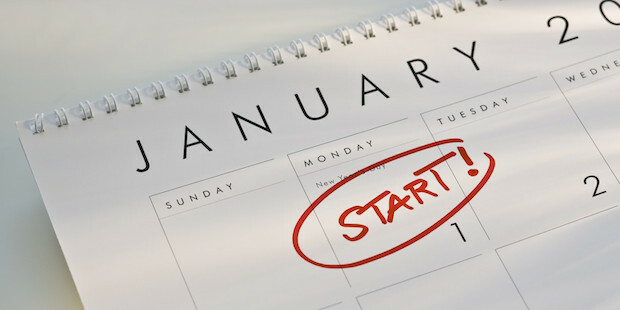 Once January 1 arrives, you've got to hit the ground running! The tricky part (for most people at least) isn't deciding what they want to do or where they'd like to be in one year's time, but in actually making those dreams come true! This can be excruciating, and many people give up. Here are four tips to help you stay true to what you want for yourself in 2016. If it's only you checking in on yourself, it becomes pretty easy to give up on your resolutions, but if someone's doing it with you, there's at least a little bit more accountability. For some reason, we as people are very bad at forcing ourselves to do things, even if we know they're good for us and will help us. Thankfully, we're also (usually) good at making others do things or feel bad for not doing something. If you want, you can set up some kind of system where you and your friend check in on each other in certain intervals. Perhaps every day, once a week, or even once a month, depending on the resolution. If you want to write and record more music, having somebody ask you once a week how things are going is probably a good idea. Don't be afraid to be strict with whomever you're watching, and tell your friend to do the same. This is the year you're totally going to stick with these resolutions! Many resolutions fall apart before they even begin because it seems impossible to get from where you are on January 1 to where you want to be 12 months later on December 31. It's a lot of work, and even just thinking about taking on a big new commitment can be scary. So how should you approach it? Well, don't say you want to lose 50 pounds and then be upset when it doesn’t happen by February. Instead, look at things on a weekly basis. Did you eat how you were supposed to? Did you exercise regularly? The more you can break down your goals into achievable, bite-sized items (joke intended), the more likely you are to stay on track. Another problem people have when making resolutions is that they don't understand just how much time or effort it'll really take. Before you truly commit to something for the year, stop and think about what it will cost you in terms of effort, time, and actual money. Don't decide you're going to go on a worldwide tour of five continents when you haven't planned anything, still have an album to record, and have no money. You'll end up disappointed next December, and nobody likes that feeling. Instead, why not pledge to play a few shows internationally, or even just in other states where you've never toured? If that works out, you can start looking to the rest of the world. While I certainly am not advocating giving up on your resolutions, it's good to stop and think about if they're really the best thing for you at the current time. Situations change, and maybe you need to stop and focus your efforts and resources elsewhere. Perhaps you aren't getting where you want, and you need to work harder. If you wanted to record an album by the end of the year, but things are going too slowly and studio costs are piling up, maybe think about shifting and putting out a single or even an EP. You can still continue to work on your original goal, but with a few small adjustments. In the end, you might not do everything you hope to in 2016 – don't worry, none of us will – but if you can stick with at least a few important resolutions, you can end next year feeling much better about yourself. How do you plan on sticking to your 2016 resolutions? Let us know in the comments below!